In August 2014, I worked with James Dunnett of DOCOMOMO to write a listing upgrade nomination for all of Ernö Goldfinger's buildings and spaces at the Brownfield Estate. In October 2015 Historic England and the Department for Culture, Media and Sport accepted our bid and upgraded Balfron's listing to Grade II*. SUMMARY OF THE BUILDING: High-rise block of flats and maisonettes, 1965-7 by Ernö Goldfinger, built as phase 1 of the London County Council (later Greater London Council -GLC) Brownfield Estate. Mixed development public housing scheme, approved for development by the LCC in 1959 and designed by Ernö Goldfinger from 1963. Built in three phases: Balfron Tower, old people’s housing and shop in St Leonard’s Road, 1965-7; Carradale House, 1967-8; Glenkerry House (1972-5), 2-24, 26-46 and 48-94 Burcham Street and Burcham Street Centre, 1972 onwards. The community centre/nursery in St Leonard’s Road was designed as part of phase 2 and built in phase 3. Group value: Balfron Tower has strong group value with the low-rise and high-rise elements of the estate, most notably with Carradale House, and the space within which it stands. HISTORY: The Brownfield estate, or Rowlett Street estate as it was known at the time, was developed by the London County Council (LCC) who, short of in-house capacity, approached the architect Ernö Goldfinger. In 1951 Poplar Borough Council approved a programme to build 300 dwellings on the Tetley Street site to the south and west of Rowlett Street. Before the first block (Langdon House) was completed, the LCC assumed responsibility for developing the area as an eastern extension to the Lansbury estate and part of the wider Stepney and Poplar Reconstruction Area and in May 1955 approved designs by the Architect’s Department for a low-rise development of 354 dwellings at a density of 142 persons to the acre (ppa). It consisted of a mixture of 2-storey terraces, 4-storey maisonette blocks and 2/3-storey blocks of flats. Construction commenced in early 1957 and was substantially complete by 1961. The site was named the Brownfield Estate in July 1958 after an existing road, itself named after a local doctor. EVOLUTION OF THE SCHEME: Rowlett Street Stage I The LCC in May 1959 approved an estimate of £50,400 for the acquisition, clearance and partial redevelopment of the first of three extensions to the Brownfield Estate, prompted by clearance and the construction of the Blackwall Tunnel approach; the site was developed in stages to facilitate site acquisition and the rehousing of residents. The density was to be increased from 170ppa to compensate for land take for the Blackwall Tunnel. Having approached Goldfinger in October 1962, the following month the LCC produced a sketch layout of three 15-storey point blocks as an indication of the type of scheme they anticipated, including the potential for some low buildings for the elderly. When Goldfinger’s scheme was presented to the LCC in June 1963 the LCC architect described Balfron Tower as a ‘landmark’ building and commented that ‘a high sense of visual drama would be achieved while emerging from the Blackwall Tunnel’. 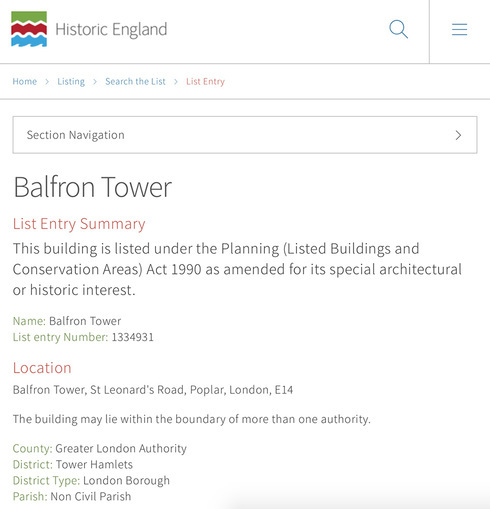 Detailed Stage I proposals received approval in February 1964; the contract started on site in June 1965 and was completed in October 1967, with a topping out ceremony on Balfron Tower on 22 February 1968. Rowlett Street Stage II Goldfinger was briefed about a future site extension as early as February 1963 and at the outset prepared sketches for the complete site [i.e. phases 1 and 2]. Thus the first two phases were planned as a whole, to be executed in two halves, and densities and dwelling types were calculated in aggregate. Although delay had been anticipated, phase 2 was however held back by the LCC’s decision to rehouse in Balfron Tower residents who had been displaced by the site clearance. The LCC authorised the acquisition of the Stage II site in November 1964; Goldfinger received a formal commission in December 1965, and in July 1967 his proposals for Carradale House were accepted. Rowlett Street Stage III The LCC reported in December 1966 that the land south of Burcham Street would be redeveloped to provide 129 new dwellings. At 2.89 acres gross, stage III was the largest site but was developed less intensively than the preceding phases (174 ppa compared with 216 for phase 1 and 205 for phase 2). Additionally it was subject to economies imposed by the new Housing Cost Yardstick (government policy introduced to control public sector housing costs). A drawing from December 1969 (RSHIII/109) shows the rudimentary Glenkerry House, three low-rise blocks, community building and car park block to the west in relation to the existing Balfron Tower and Carradale House. Perspective drawings of early 1970 depict Glenkerry House and the low rise blocks fronting Burcham Street. Glenkerry House was built between 1972 and 1975, and the project was complete or nearing completion by 1976. The relatively long development period was characteristic of the 1970s. Ernö Goldfinger A Hungarian émigré, born in Budapest, Ernö Goldfinger (1902-1987) moved to Paris in 1920 and to London in 1934. He stands out as one of the only architects trained under Auguste Perret at the École des Beaux-Arts in Paris in the 1920s, and who was closely involved in the early years of the Modern Movement on the Continent, to find acceptance in Britain. He is held in high regard as a major exponent of these ideas in England in the post-war period. Firmly rooted in Perret's Structural-Rationalism, he was strongly influenced by Le Corbusier's social idealist views and architecture, embodied in the slogan ‘Soleil, Espace, Verdure’ (sun, space, greenery). The Brownfield estate epitomises these ideas and the Balfron Tower in particular is one of the closest parallels to European modernism to be built in this country. Having first produced designs for housing in 1929 in Algiers, Goldfinger went on to develop ideas for high-rise housing, culminating at that time in a scheme for a 24-storey communal housing scheme, again unbuilt, but exhibited at the CIAM (Les Congrès Internationaux d'Architecture Moderne) conference in Athens in 1933. In designs for mixed development housing schemes at Abbotts Langley, Herts of 1956-8, comprising a thirteen-storey slab (unbuilt) and three and four-storey blocks and terraces of maisonettes and flats, approached by detached stair towers, Goldfinger explored the Corbusian inspired ‘rue interieure’ formula for tall blocks of flats and maisonettes served by an internal gallery. His solution created an interlocking section whereby three floors of flats per bay were served by an enclosed gallery, thus providing greater opportunity for social interaction. These principles were fundamental to his later schemes, influencing both the Brownfield estate and the slightly later Cheltenham estate, LB Kensington and Chelsea (Trellick Tower, 1968-72, Grade II*, low rise housing, Cheltenham estate, 1969-73, Grade II). BALFRON TOWER: Balfron Tower is the earliest component of the two large blocks of flats and maisonettes that were arguably the most important commissions of his career and has a distinctive profile that sets it apart from other tall blocks. More importantly, it proved that such blocks could be well planned and beautifully finished, revealing Goldfinger as a master in the production of finely textured and long-lasting concrete masses. Balfron Tower was designed as a social entity to re-house a community, according with Goldfinger's socialist thinking. Families were re-housed street by street, former neighbours sharing common access galleries. Access to enclosed galleries was secure, stair wells were well lit. As well as services and the boiler the circulation tower included a launderette, a table tennis or billiards room and jazz/pop room for teenagers and a hobby room. Ground floor maisonettes had small gardens and a playground was built on the hard surface above the garages. Phase 1 of the scheme for the estate also included old people's housing, a shop and a community centre and nursery was added later. On completion in 1968, Goldfinger and his wife Ursula received attention for living in one of the flats for eight weeks, giving him the opportunity to document aspects of living there, which formed a report to the GLC and was later published by the Twentieth Century Society. STRUCTURE AND MATERIALS: reinforced concrete, with timber cladding to balconies, and an asphalt flat roof. Bush hammered concrete is well detailed, with fair margins and radiused (rounded) corners and executed to a high standard. There are marble linings to the hall, and sapele hardwood doors. PLAN: 136 one- and two-bedroomed flats and ten maisonettes arranged on 26 storeys, with six units per floor and five maisonettes on floors 1 and 2 and 15 and 16 - the latter forming a distinctive break in the pattern of the fenestration and balconies. The units are served at every third floor by enclosed corridors or access galleries linking them to an otherwise detached service tower containing lifts, rubbish chutes, laundry rooms and former games, music and hobby rooms, and topped by a boiler tower with a stepped profile and chimneys. One bedroom flats open directly onto the access gallery; above and below, accessed by internal stairs, are dual aspect flats. At the southern end of the building there is a secondary stair. EXTERIOR: the west facing elevation, to St Leonard's Road, has balconies to every flat, those to the maisonettes set on the upper floor are cuboid in form, projecting from the centre of the unit and forming a distinctive pattern. The west elevation has the original rectangular timber windows with a thick profile that serve as a vertical contrast to the horizontal rhythm of the balcony fronts. On the rear, east, elevation access corridors are expressed at every third floor by a continuous band. Window units (replaced but not to Goldfinger's original specification) are in groups of three with a full height central light. Originally the block was topped by a thick cornice which was removed some years ago. The iconic service tower is lit by vertical slit lights, arranged in groups of five, ten or fifteen on the west face in three or five on the other faces. The boiler house and chimneys were altered early on, assuming their current profile, to provide capacity for Carradale House when it was built. The main, west entrance, approached by a concrete walkway and bridge with a tiled surface, is in a projecting pod and has a hardwood door with vertical glazed panels (replacing the original plate glass screens). There is a similar but isolated projection on the east face that originally connected to an east walkway, providing a throughway, which was later removed, probably when the Blackwall Tunnel approach road was widened. INTERIOR: the hard finishes of these interiors are unusually well thought out and flats are generously proportioned, light and airy. The entrance hall is marble lined, though part replaced in green tiles. Doorways in lift lobbies have robust concrete shouldered frames, and doors to common areas are of hardwood with vertical glazed panels and full height moulded handles. Stair wells within the service tower are enclosed, generously proportioned, lit by ranks of slit windows and have steel balustrades allowing sight up and down. In the access galleries the concrete frame and wall panels, in different aggregates, are exposed. Inner walls are clad in brightly coloured glazed tiles, different colours distinguishing the different levels; floors are quarry tiled. A number of un-renovated flats have original flush panel entrance doors and fittings and retain their original plan and fixtures and fittings including interlocking stairs, some with horizontal timber balustrades. Flush panel doors have slender architraves and some retain Goldfinger's integral light switches.